IT VIRTUALLY brings the curtain down on the UK 2017 UK-India Year of Culture programme. The finale concert of the UK-India 2017 programme will take place at the Barbican Concert Hall tomorrow (November 28) featuring the composer and musician, Dr L Subramaniam, Kavita Krishnamurti and the London Symphony Orchestra. To tell us about it, Dr L Subramaniam dropped into the Nehru Centre in Mayfair, London on Friday (November 24) and addressed a press conference with a small selection of journalists. www.asianculturevulture.com was there. He later told www.asianculturevulture.com that the Bharat Symphony was the “story of India in musical concert form”. He explained that the symphony begins with the Vedic period, and then the second movement is the Mughal period where Persian influences enter into existing Indian classical music. It is followed by the third segment which focuses on British rule – when the violin was introduced to India and there is a lot of orchestral sound. The fourth and final movement features deals with Post Independence India, and incorporates a global influence in sound “as other influences have come into India and also gone out of India”, said Dr Subramaniam. He told the audience that the ‘Bharat Symphony’ was commissioned by The City of Chicago to celebrate the 70th anniversary of Indian independence, and it was where it premiered at the Jay Pritzker Pavilion in the Millennium Park on September 9 this year. Dr Subramaniam said that the vocals in the ‘Bharat Symphony’ take cognisance of the same evolutionary style. In the first movement there are Sanskrit Slokas mirroring the Vedas, later the chants increase and post Independence India sections feature influences of Gandhian thought, such as the concept of ‘Satyamev Jayate’ (Truth, Honesty) and ‘Vasudhaiva Kutumbakam’ (The World is One Family) with ideas of diversity and plurality all of which will be sung by Kavita Krishnamurti. along with the London Voices community choir. The composition will be performed by the London Symphony Orchestra and it will be be conducted by the “very excellent Maestro” Josep Vicent, he said. Dr. Subramaniam explained that the concert will begin with a sample of Indian classical music, performed by him, along with Tanmoy Bose on tabla and Dhulipala Srirama Murthy on mridangam. It will followed by the Bharat Symphony and another orchestral composition entitled ‘Fantasy on Vedic Chants’, he wrote at the request of maestro, Zubin Mehta for the New York Philharmonic in 1985, when Mehta was musical director there – to celebrate India Year in the US. www.asianculturevulture.com asked the great violin composer and musician, if he had any observations on the fact that his own life mirrored that of Independent India being that they were the same age, give or take just a month! Subramaniam who was born on July 23 1947, talked about his personal life and upbringing. 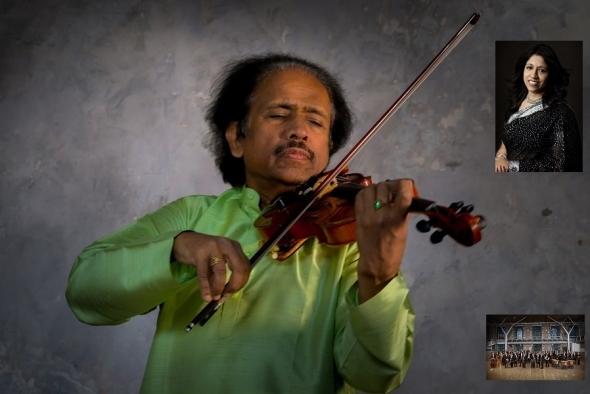 His said his father, V Lakshminarayana Iyer, an accomplished musician, was keen to turn the violin into a major solo instrument – in the way it was in western classical concert repertoire. However, this idea was contrary to what was expected of violinists in India at the time, where it was mainly an accompanying instrument, to follow singers, flute or Veena. At that time, the term ‘classical music’ was only applied to western classical music and Iyer wanted his son to learn to play the violin as a solo instrument. Dr Subramanian’s father began to develop a solo playing style, but he couldn’t play it in public as it would have stolen the limelight from the other artists. At this time, also his father was offered a professorship at Jaffna College in Sri Lanka and the family settled there. He encouraged his son to listen to the major orchestras of the time and great players such as Stéphane Grappelli, Yehudi Menuhin, Jascha Heifetz, and David Oistrakh. After the 1958 communal riots between Tamils and the Sinhalese in Sri Lanka, the family moved back to India where Dr Subramaniam was encouraged to take up a profession, as music was a precarious career. He began to study medicine at Madras Medical College, but continued to practise playing violin. Although he was talent spotted, his mother insisted he complete his degree before venturing into music full time. Later he went to the California Institute for the Arts where he did a Master’s degree in Western classical music and learnt to compose for orchestras. This was also a period when he began performing and composing for global music artists. He added: “We have a very, very highly developed South Indian classical and North Indian classical system which has been tested, so I started the term ‘Global music’ and started doing festivals and writing compositions because there were no compositions at the time for different people to play. He also began composing film scores and his credits include: ‘Salaam Bombay’ (1988) and ‘Mississippi Masala’ (1991) for Mira Nair and ‘Little Buddha’ (1993) by Bernardo Bertolucci. “So, my life in the 70 years has taken a different turn which I never planned. I just wanted to be an Indian classical violinist. www.asianculturevulture.com asked him if he was making his father’s dream come true. Dr Subramaniam was happy that his father was able to witness some of his achievements. Ever the dutiful son, he created the Lakshminarayana Global Music Festival in 1992 in the memory of his father who passed away in 1990 and today is a regular feature on the concert calendar. Alchemy 2017 at the Southbank Centre – What’s your brew?